A twilight shot of the Ft.Lauderdale Station. We weren't sure what kind of weather we'd get and nearly called this shot off as it had been gray and dreary all day. But luck was on my side that day as the skies cleared just in time for one of the most incredible sunsets I'd seen in a while, even more so because they're so rare this time of year. Winter is typically when Florida get's those rich sunset skies. The ambient light did most of the work here, but I used my Lowell hot light to add some texture on the grass in the foreground and make it look like it was lit by the station. 2018 has been the year of new career experiences. I’ve shot a farm, a cruise ship, and most recently a set of train stations for GoBrightline, South Florida’s newest intercity high-speed rail train. South Floridians are practically married to their cars. Suggesting an alternate form of transportation can get you laughed out of a room. We don't exactly have a great history with public transportation. 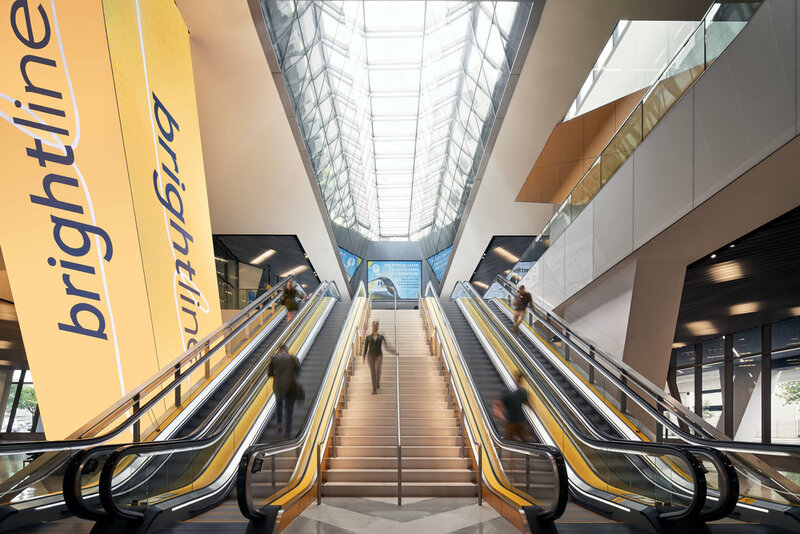 However, the privately funded services at Brightline provide one heck of an experience that will definitely alter that perception. Having taken Brightline to Ft.Lauderdale and West Palm beach myself, I can honestly say that it’s something that should definitely catch on once the public gains enough awareness. The experience beats the hell out of being stranded on I-95 any day. Instead, you're quickly whisekd to your destination in comfort with all the free wifi you can handle. I also personally find it really cool that the stations and tracks are all located along the very same East Coast Florida Railway Henry Flagler built over a hundred years ago. Hence my excitement for this project: Beautiful modern architecture intersecting with historical relevance. What’s not to love? Obviously, the photos need to be informative. Customers need to know what to expect from the lounges and amenities. But more importantly, we want to tempt them to fall in love with the experience. So I wanted to present these spaces in ways that projected a trajectory into the future full of hope. The aesthetic needed to be bright, clean and airy with no superfluous elements in the frame. I wanted them to look like sanctuaries for the optimistic, early-rising, midnight oil burning hustler trying to make the most of every second of the day. The designs by Skidmore, Owings & Merrill allowed for a seamless execution of this game plan because the stations themselves have a comforting, minimalistic aesthetic to them. I didn’t want to combat that by adding too many elements into the frame. I did my usual blend of flash and ambient exposure bracketing; however, I mixed in more ambient light than normal because, to be frank, it would be a waste to not take advantage of light seeping through those massive windows. The accent lighting is already positioned to provide depth to the scene, so in spaces with less window light, again I opted to let the ambient light make its presence known. Flash was really only used to enhance it on certain fixtures and furniture and to provide that sharp, crisp polish where appropriate. I still used quite a bit of it, but it wasn't the dominant source of light that it usually is in my regular interior work. Shooting with the A7riii makes it so easy to too because of how much damn detail is in those raw files. I couldn’t be happier with how these shots turned out, and it is my pleasure to share them now. The full gallery can be viewed here, but below are some of my favorites with a bit of insight. My Llowa 12mm with the shift adapter produces a 17mm frame, and I needed every inch to fill this shot since theres so much to see. The shifting abilities allowed me to prevent distortion almost entirely. This was shot with all natural light and I carefully placed the subjects in somewhat symmetrical patterns and used a longer shutter to give just enough motion blur. And of course I had to have my Hitchcock moment and give myself a cameo in the lower right hand corner. Another predominately natural light shot. Just the slightest hint of flash on the plant in the foreground. The lonely subject in the center gave me the optimistic aesthetic of presenting the space as a sanctuary for the early morning "go-getters" of the world. And also allowed me to subtly remind the viewer that all the stations have complimentary wifi. This one went a bit heavier with the flash as the dynamic range in this scene was quite dramatic. There was a lot of glare on the wall to my left, so the flash was critical in eliminating it and displaying this gorgeous, and imposing piece of art on the wall. The simplest shot of the whole project as the lighting was just perfect in how it split the building practically down the middle. All it took was just the right framing with my 24mm tilt-shift lens and an ND filter to lower my shutter enough to capture some motion blur in the moving elements of the scene.